Quantum Dragon presents the west coast premiere of “The Dos and Donts of Time Travel” at the Phoenix Theatre, located on the sixth floor of a small, unassuming, blink-and-you’ll-miss-it office building, nestled up to the derelict husk of the old Ruby Skye nightclub. The lobby is brightly lit with fluorescent bulbs and the elevator that takes you to the 6th floor feels like it’s constantly deciding whether or not it should drop you rather than lift you. Once you’ve navigated the elevator and the lobby, you’ll find the Phoenix to be a small theatre-in-the-round that holds a special charm with its antique chairs, cozy atmosphere, and inviting staff. It is a fit setting for this lovely piece of performance art. At each performance, “The Dos and Donts of Time Travel” is preceded by an additional short play prior to the main event. On opening night, that play was “Flat Headed Plebeians” by Colin Johnson, starring Marisa Darabi and Caitlin Evenson, both of whom also star in the main play. “Flat Headed Plebeians” centers around a self-obsessed science fiction writer and one of her fans as they go through a rather heated discourse over the internet. The direction feels very focused and the characters are studiously realized. It is a very clever piece presented with an over-the-top style of performance that succeeds in being more charming than pretentious. Full of commentary on the modern internet nerd and fan culture, “Flat Headed Plebians” is well thought out, through and through. “The Dos and Donts of Time Travel” stars Miranda Reilly and Kitty Torres as two versions of Zoey, a woman unstuck in time, reliving the same events over and over again The two actresses switch roles on a nightly basis. Also featured is Caitlin Evenson as Claire, Zoey’s long time partner and Marisa Darabi as Zoey’s best friend and guide through the actual do’s and dont’s. The script is a witty, tongue-in-cheek take on the philosophies and mechanics of every time travel film or novel in history. The script does not hold back on its pop culture references, This was fun and kept things light for a little while, but at a certain point it started to feel overloaded and maybe a little forced. There wasn’t any point where this detracted from the main story. For example, the long-winded explanation of the “McFly Fallacy” seemed a bit unnecessary. Many of these rules could have been shown to us rather than explained. Nevertheless, as Zoey’s guide, Marisa Darabi fleshed out her character in a very robust and fulfilling manner, chewing the scenery in a deliciously satisfying way. It’s clear that her comedic talents are being put to good use. As confusing as all this might sound, playwright Nicholas Wardigo and director Anna Smith are able to keep things clear. The plot never becomes muddled or too slow. Aside from its science fiction premise, the play is largely a study in the power dynamics of maintaining a relationship. “The Dos and Donts of Time Travel’ continues at The Pheonix Theater through January 26, 2019. For further information click here. 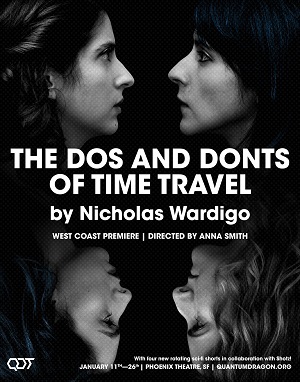 “The Dos and Donts of Time Travel” by Nicholas Wardigo, west coast premiere produced by Quantum Dragon Theater. Director: Anna Smith. Lighting Design: Sara Saavedra. Sound Design: Michael Kelly. Set Design: Katie Whitcraft. Costume Design: Emily Dwyer. Zoey 1: Miranda Reilly. Zoey 2: Kitty Torres. Claire: Caitlin Evenson. Rachel: Marisa Darabi. “Flat Headed Plebians” by Colin Johnson, produced by Quantum Dragon Theater. Marisa Daribi + Caitlin Evenson. Posted in Reviews.Tagged Anna Smith, Caitlin Evenson, Charles Kruger, Colin Johnson, er, Flat HeadedPlebians, Jason Whitacre, Kitty Torres, Marisa Daribi, Miranda Reilly, Nicholas Wardigo, Quantum Dragon Theater, The Do's and Don'ts of Time Travel, theatrestorm.